Udupi, Aug 8,2017: Pramod Madhwaraj, Minister of State for Fisheries, Youth Empowerment and Sports, said on Monday that a subsidy of Rs. 16 crore had been released for diesel supplied to fishermen in April and May this year. This money had been transferred directly to the bank accounts of the fishermen. He was speaking after distributing pass books (for diesel subsidy) to the fishermen at the Taluk Panchayat Hall, here. Mr. Madhwaraj said that after he became Minister, feasibility certificates were being given to young fishermen to purchase boats so that they could become self-employed. As a result, they had all the necessary documents when they went for fishing. They need not be frightened when they were subject to checking by Coast Guard or other authorities due to the feasibility certificate. They could carry on their fishing activities without fear. Under the regularisation scheme, 137 fishermen, who had recently received the feasibility certificates, were given the pass books. The diesel bunks at the harbours had to provide subsidised diesel only to those fishermen who had these pass books. If the diesel bunks were found giving away diesel illegally, they would be black-listed, Mr. Madhwaraj said. Earlier in the day, fishermen offered Samudra Puje at the Vadabhandeshwara (Balarama) Temple at Malpe and then to the sea god on the Malpe beach here seeking a prosperous fishing season. 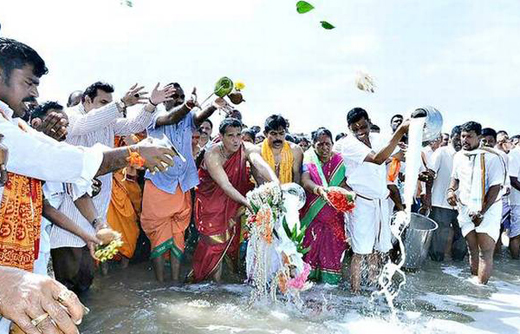 Mr. Madhwaraj, who participated in the function, told presspersons that it was a tradition for the fishermen community in the State and elsewhere to offer prayers to the sea god during “Nariyal Poornima”. Fishermen went fishing after the “Nariyal Poornima”. Though the fishing season started after the two-month ban on August 1, the sea was rough. Hence, the fishermen could not enter the sea with their boats. .
Meenakshi Bannanje, president of Udupi City Municipal Council, Yashpal Suvarna, president of Dakshina Kannada and Udupi Fish Marketing Federation, Hiriyanna T. Kediyoor, president of Malpe Fishermen’s Association, and others were present.